Developing your interview skills is arguably the hardest part of any job hunt. As exciting as it can be to get the opportunity to interview at a company you love, the excitement you feel can quickly turn to anxiety as you realize how much is riding on your performance. Job interviews are your biggest chance to prove yourself to a potential employer, and that makes them all the more stressful. Especially in creative industries, nailing a job interview can be tricky. Often, employers care just as much about your talent as they do your experience—which means simply listing past jobs and explaining your technical skill might not be enough. And, even then, it can be just as hard to talk confidently about your talents without seeming conceited. Not to mention that when you want a job in design, fashion, or other visual fields, the way you present yourself and what you wear might hold even more weight than usual. Nevertheless, as hard as an interview in a creative industry might be, there are ways you can prepare yourself. The five apps below will help you perfect your interview skills, so you’ll be ready for the unique challenges you might encounter as a creative professional and ready to show your interviewers why you should be their next employee. Interview Prep Questions. Interviewers all ask different questions, so you can never be certain about what to expect. Nevertheless, there are some common questions you can be ready for. 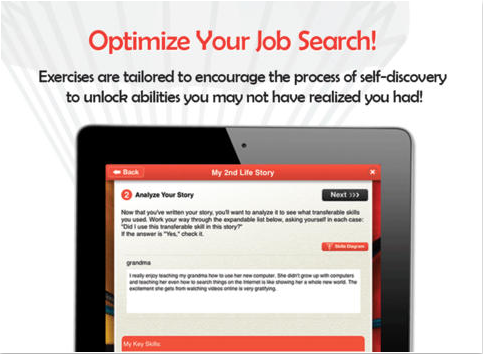 This app helps you practice answering tough interview questions, so that you can get used to thinking on your feet and be prepared for whatever tough questions might come your way. 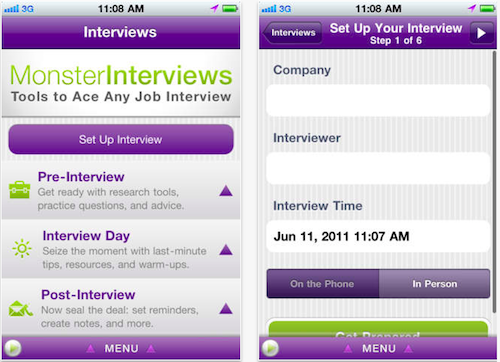 Monster Interviews App. Monster.com’s interview app is a comprehensive way to organize your interviews, especially when you’ve got more than one. With an array of tools, organized into “Pre Interview,” “Interview Day,” and “Post Interview” categories, you’ll have assistance at every step of the process. For before your interview, there’s a calendar to manage interview times and locations. For the day of, the app has brainteasers, route maps, local services (like coffee shops and printers near offices), last-minute tips, and even a tool that lets you make a playlist full of your favorite pump-up jams. For after the interview, you can take notes from your interview, schedule follow-up reminders, and read tips on how to proceed if you get an offer. Style Apps. Especially in creative industries, what you wear to your interview will speak volumes about you. Though that’s especially true for fashion interviews, your clothes will show off your creativity, your aesthetic, and your stylishness to employers in any field. 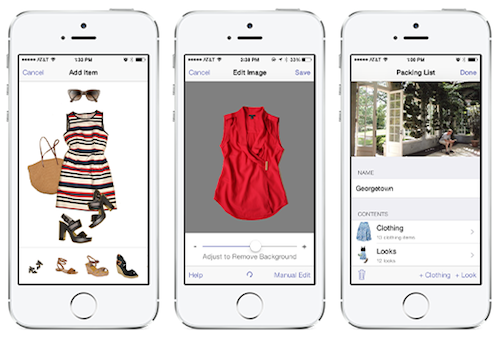 There are tons of apps for organizing your wardrobe and putting together perfect outfits, including the popular apps Stylebook for women and ModMan for men. What Color Is Your Parachute? For jobs in creative industries, you’ll face different situations and questions than candidates in other industries, and you’ll need the interview skills to match. Employers often ask creatives deeper questions about themselves, who they are and what they’re about. “What Color Is Your Parachute” is an iPad app that serves as a digital workbook to help you figure out your answers to these types of questions. It won’t just help you learn how to articulate your answers, but inspire you and get you in the right mindset for more offbeat questions. Breathe2Relax. No matter how much preparation you do for an interview, and no matter how impeccable you look, you won’t make a good impression if you sound rehearsed or anxious. 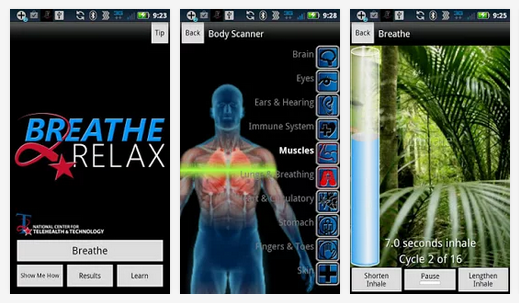 This free app teaches you how to breathe best for deep relaxation, plays calming music, and guides you through breathing sequences—so you can just put on your headphones, take a few deep breathes, and be ready to confidently take on any interview. 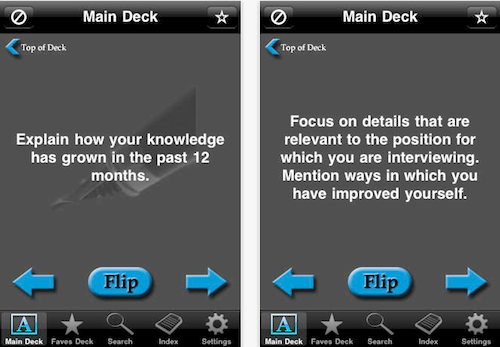 With any or all of these apps in your pocket, you’ll be well equipped to handle any type of job interview. So get your job hunt going, and browse our latest openings on The Creative Loft.